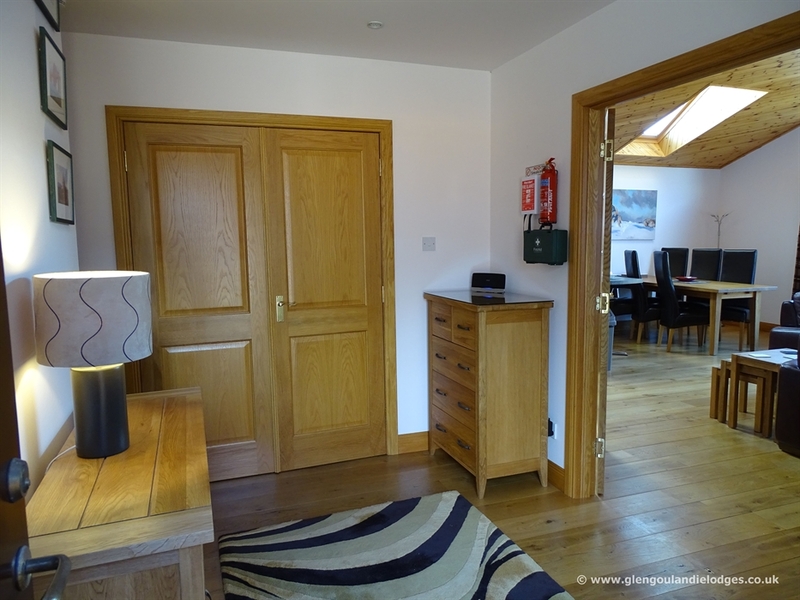 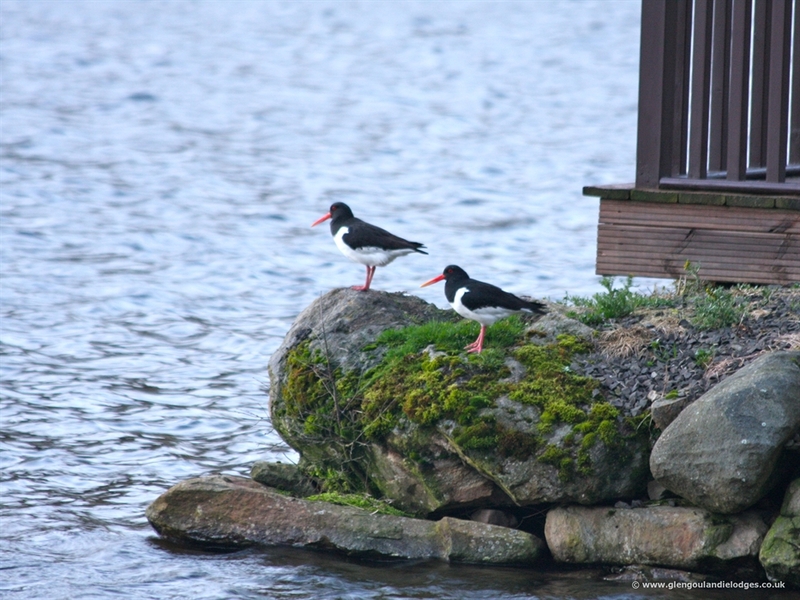 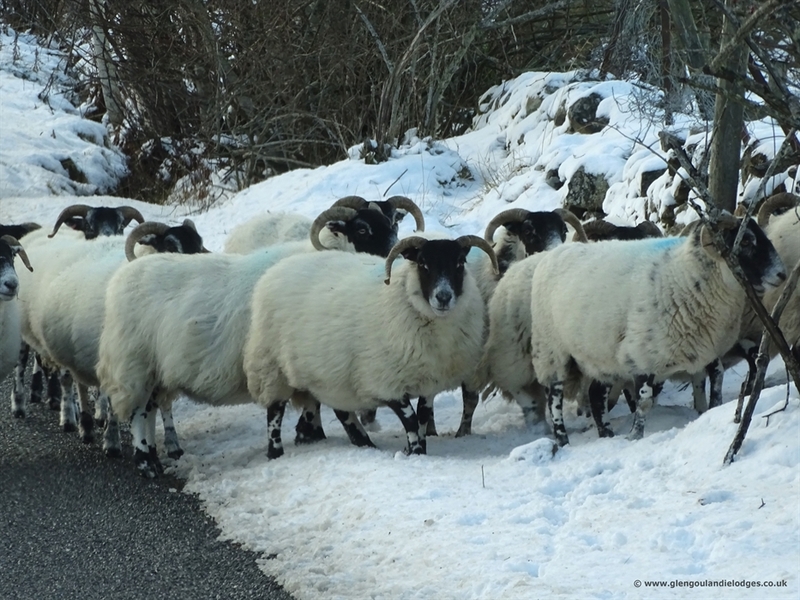 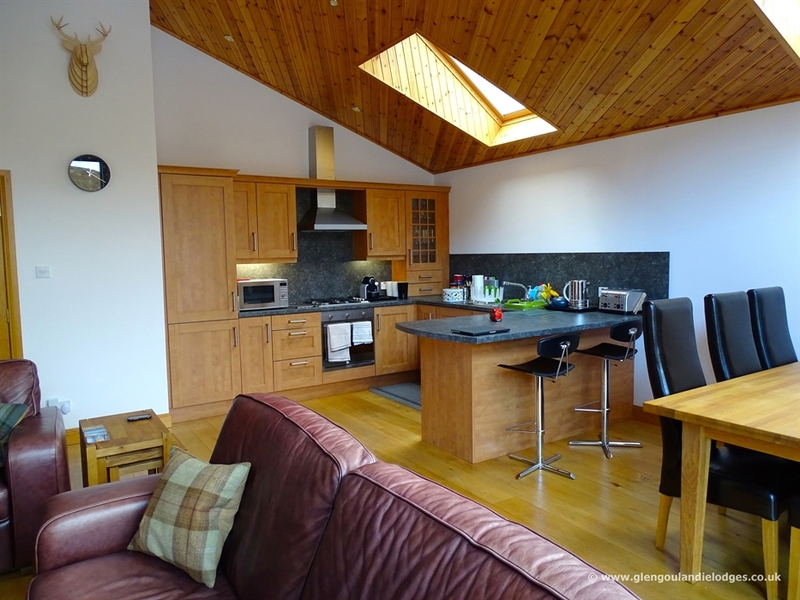 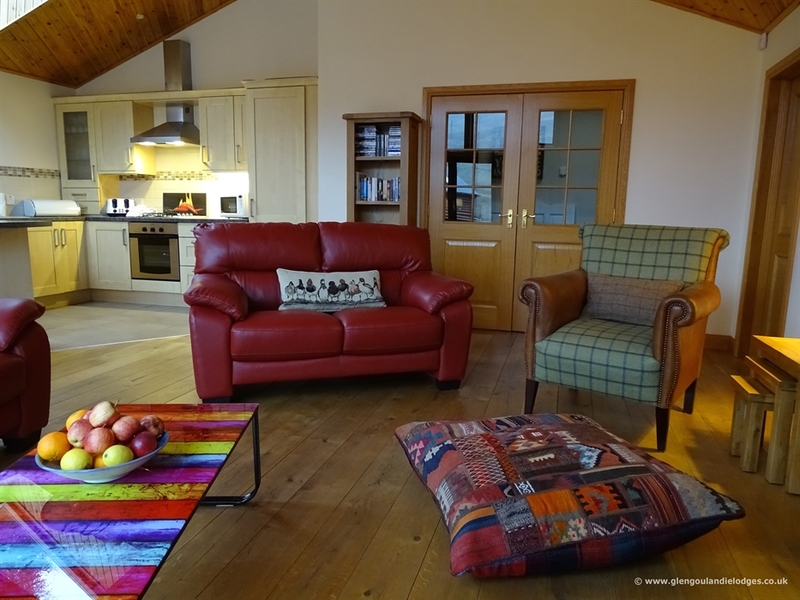 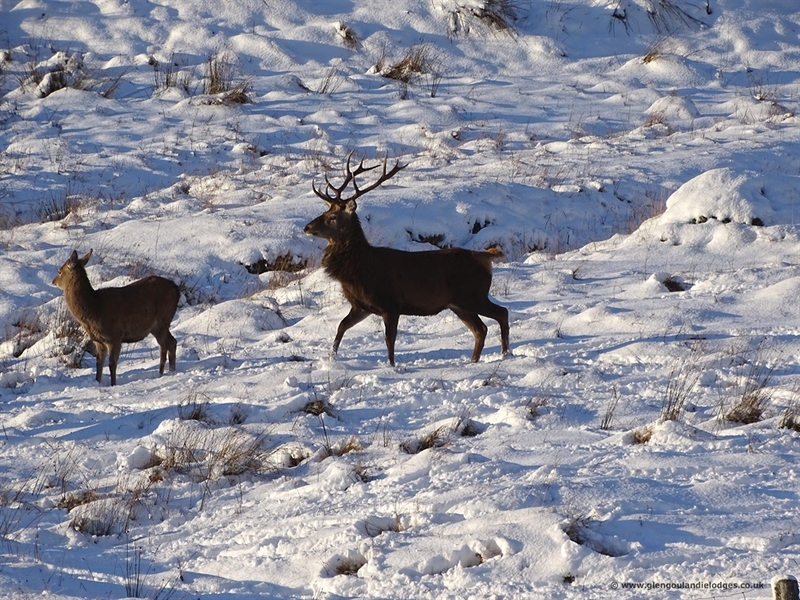 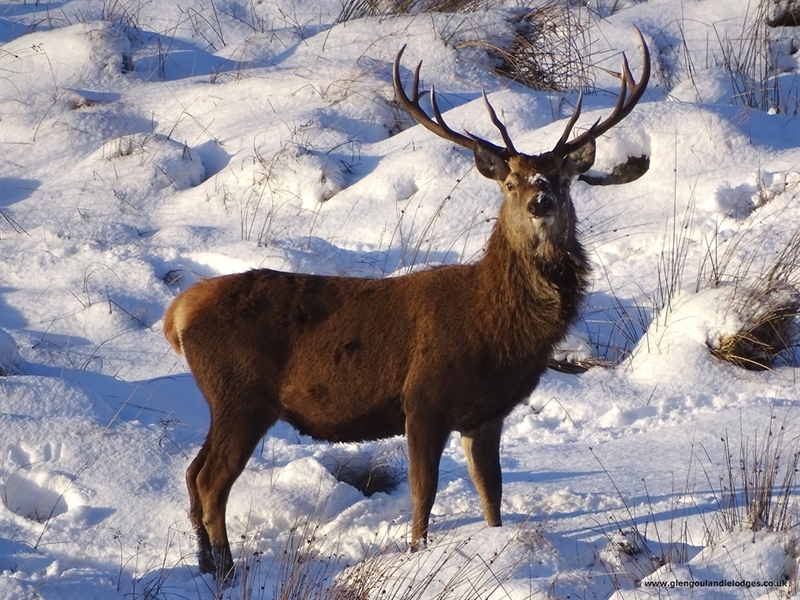 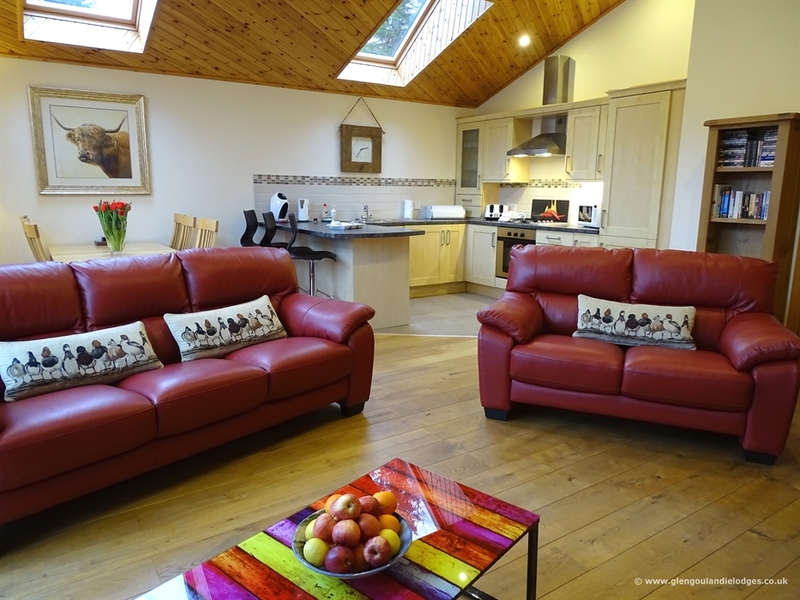 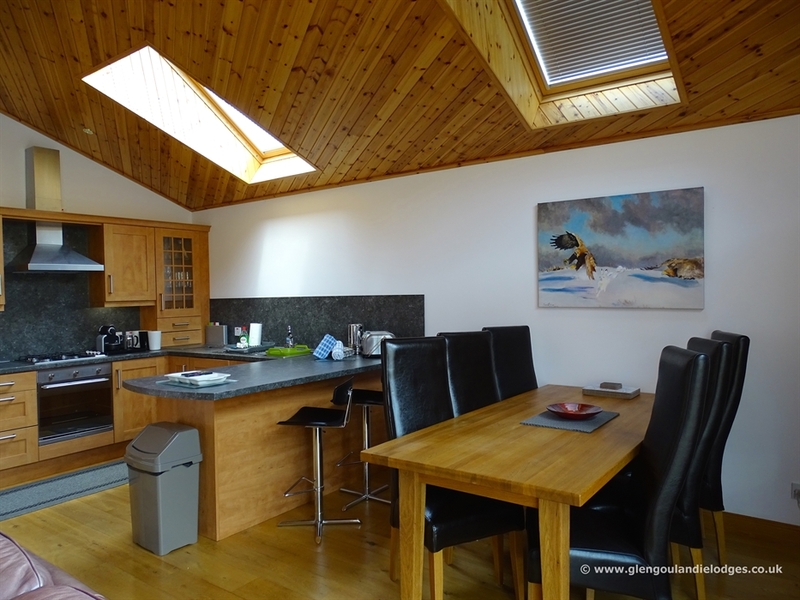 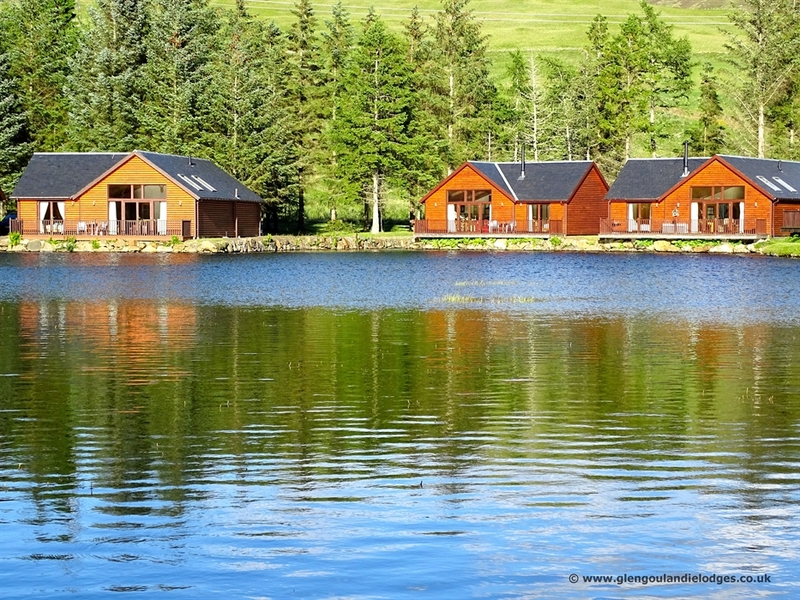 Availability Search for Glengoulandie Lodges - On The Waterfront. 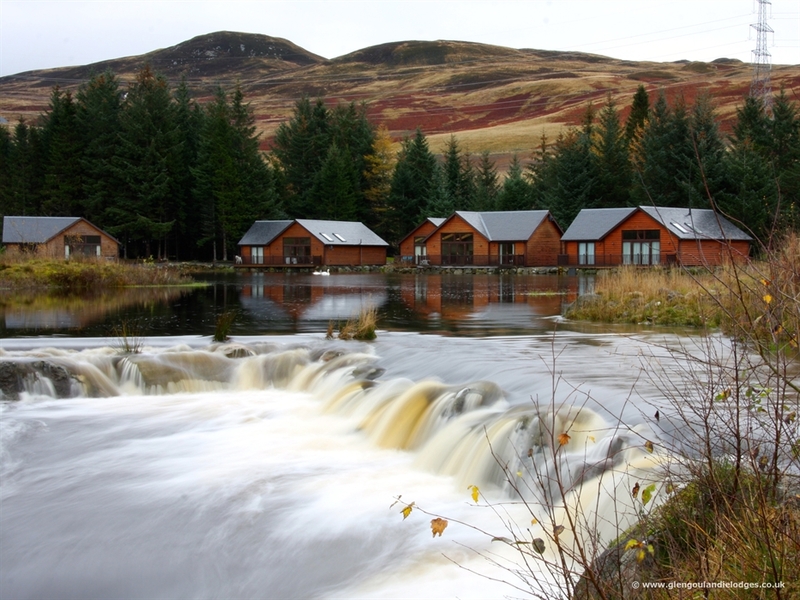 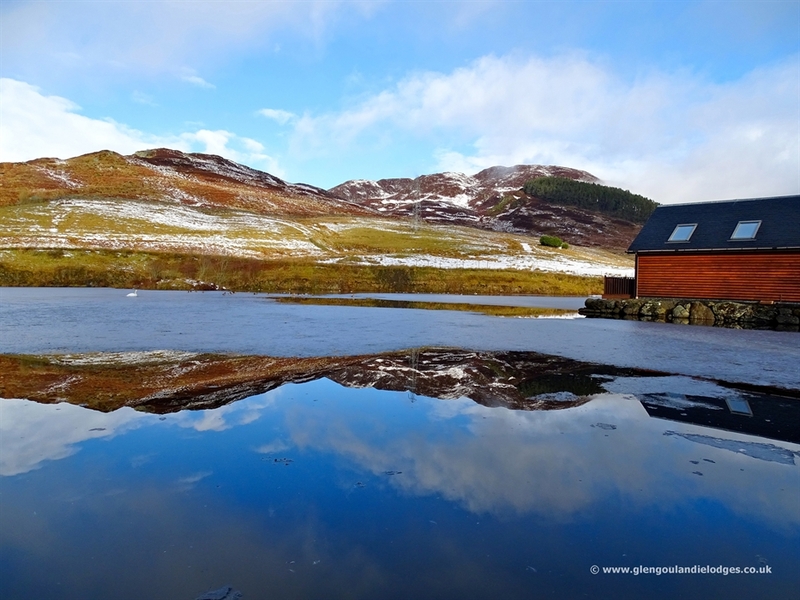 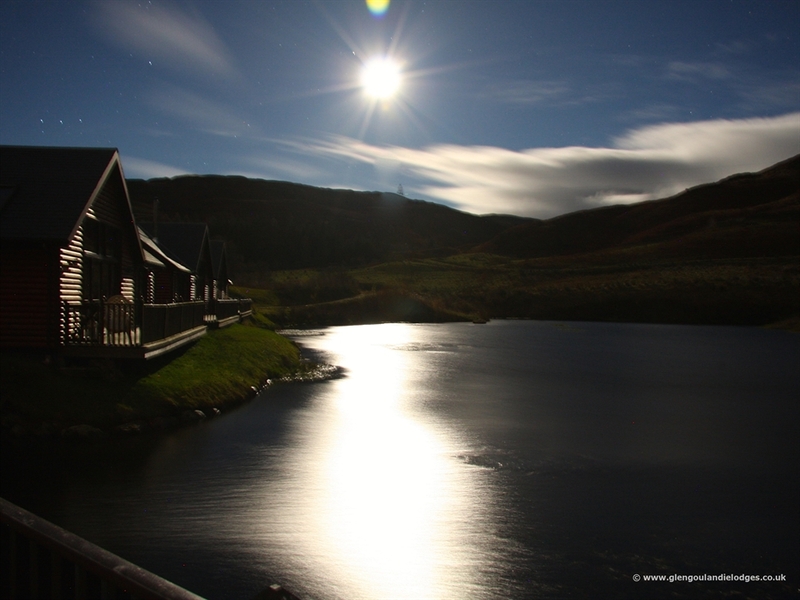 Glengoulandie Lodges - On The Waterfront. 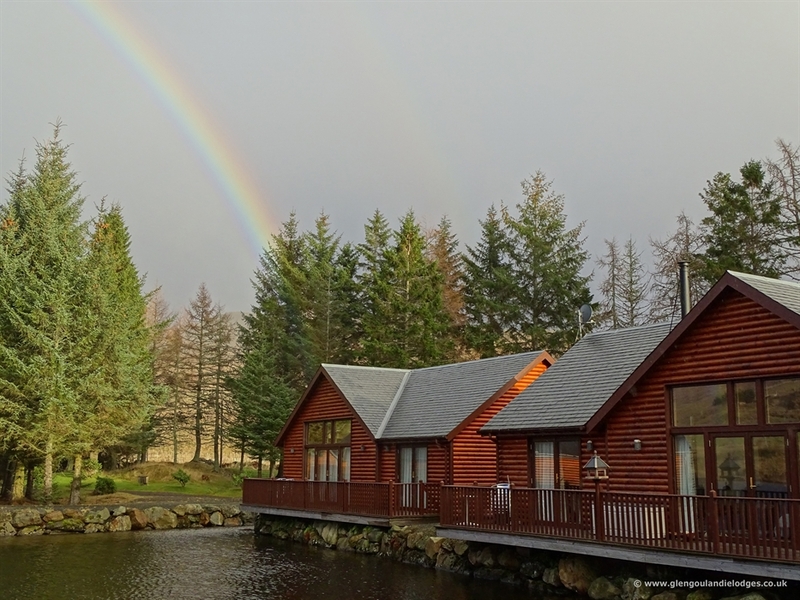 Eagle, Rainbow & Dragonfly Lodges, are three unique and outstanding Lodges situated on the Waterfront of a beautiful Highland Lochan at Glengoulandie, near Aberfeldy. 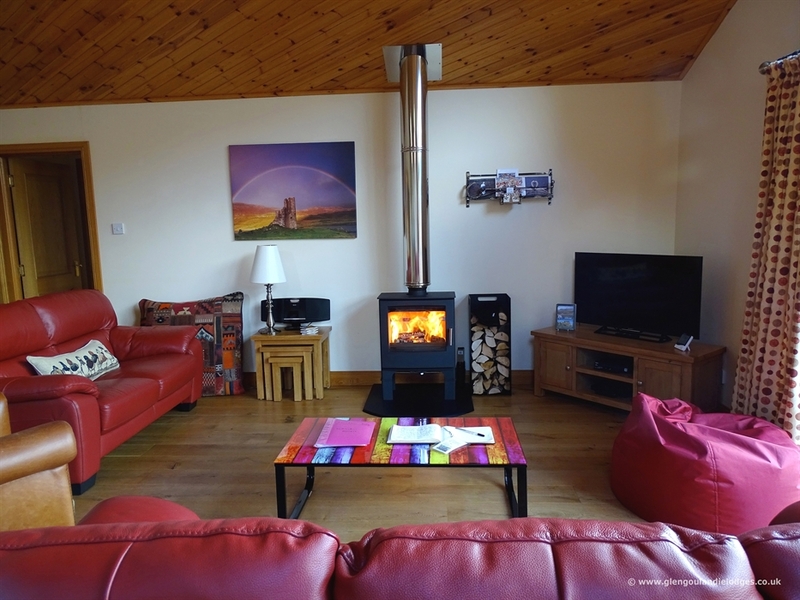 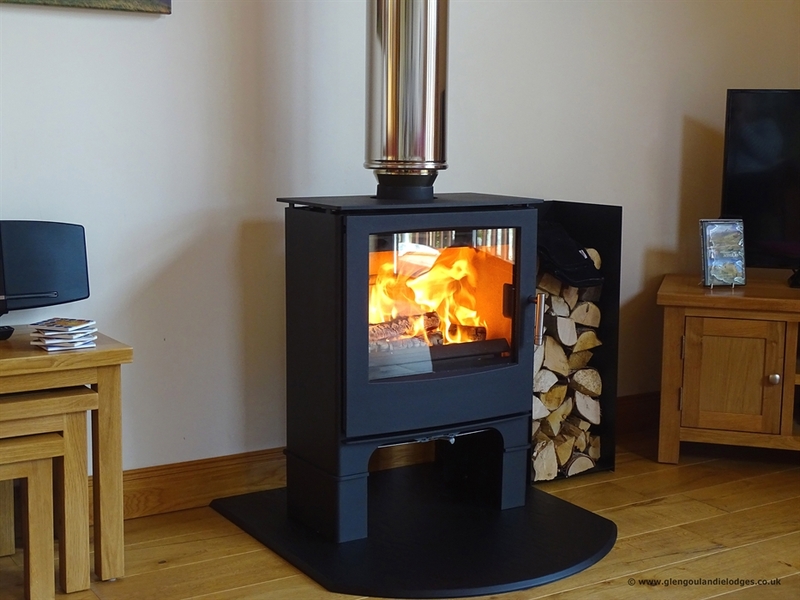 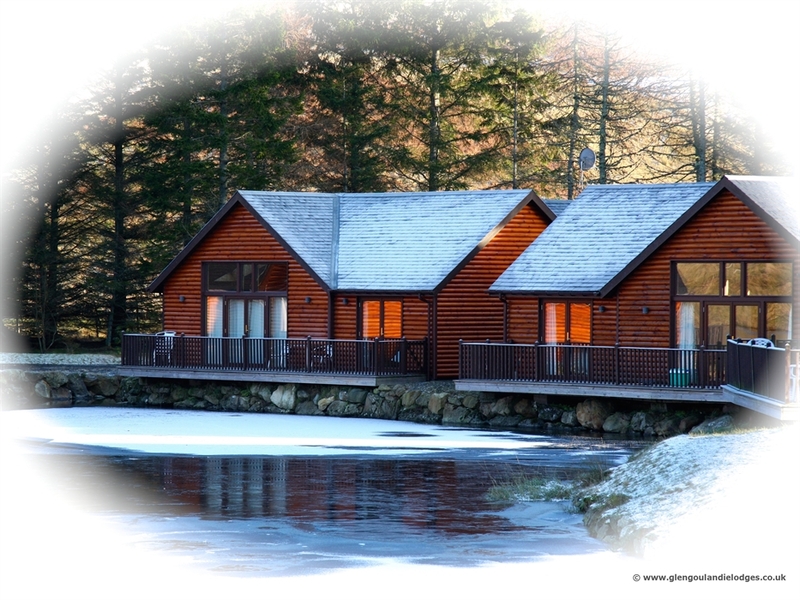 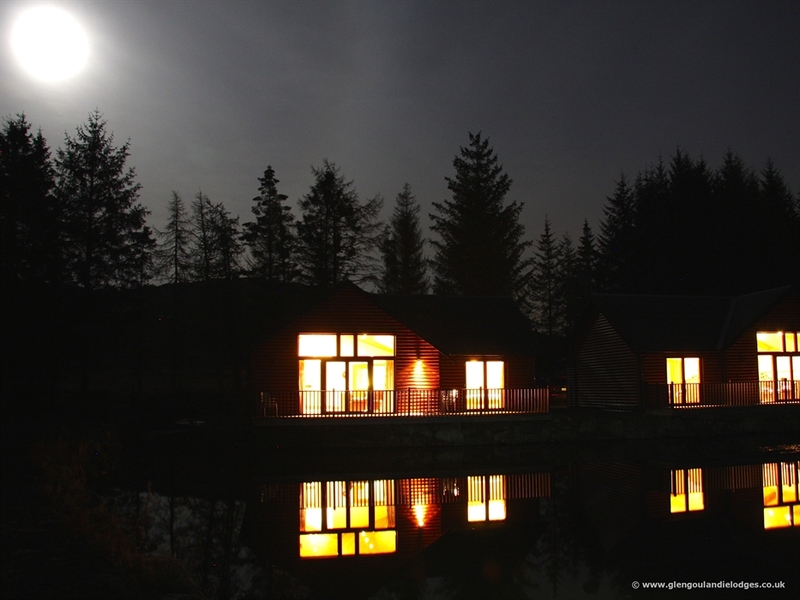 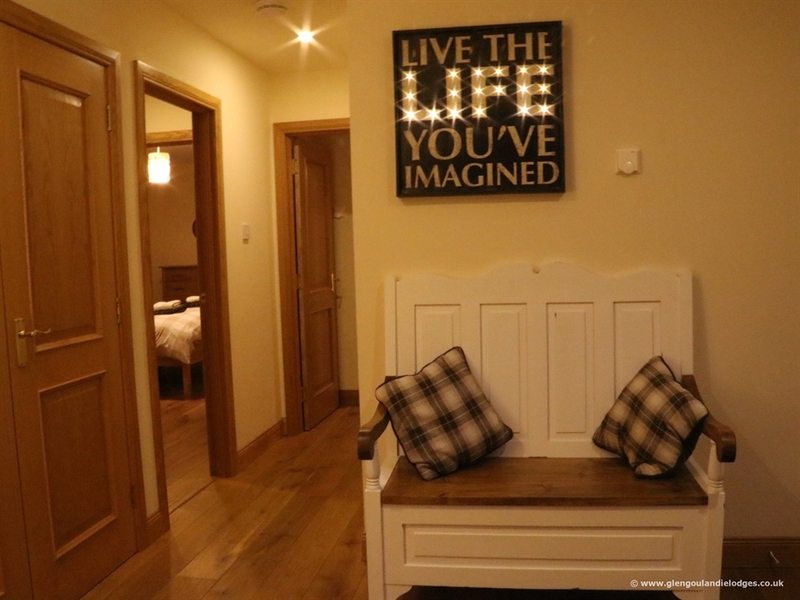 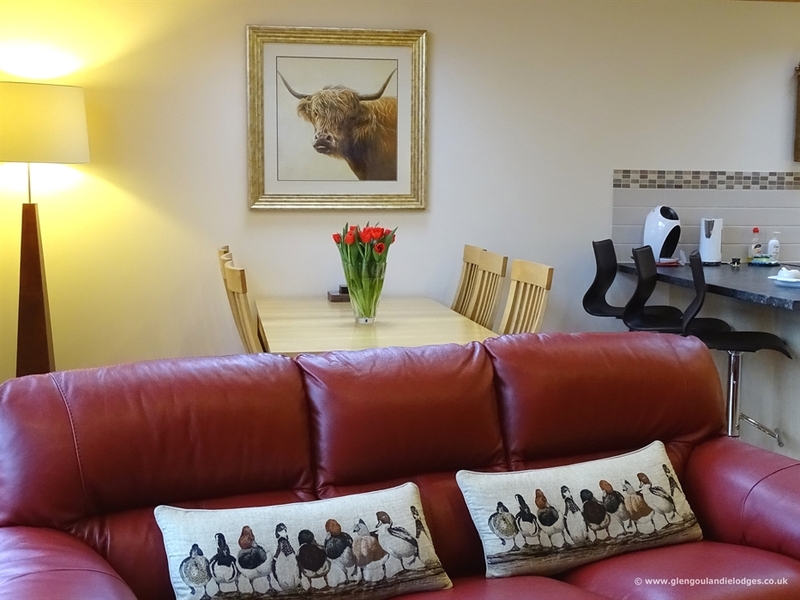 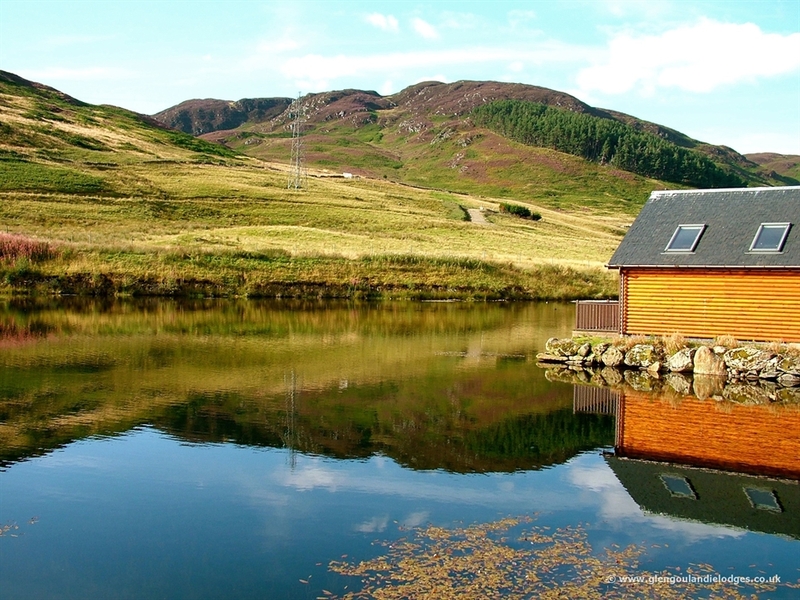 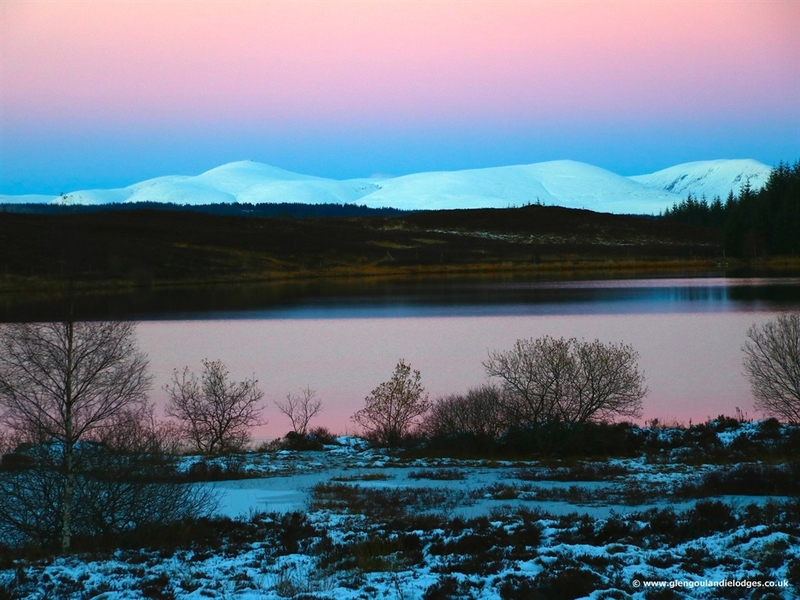 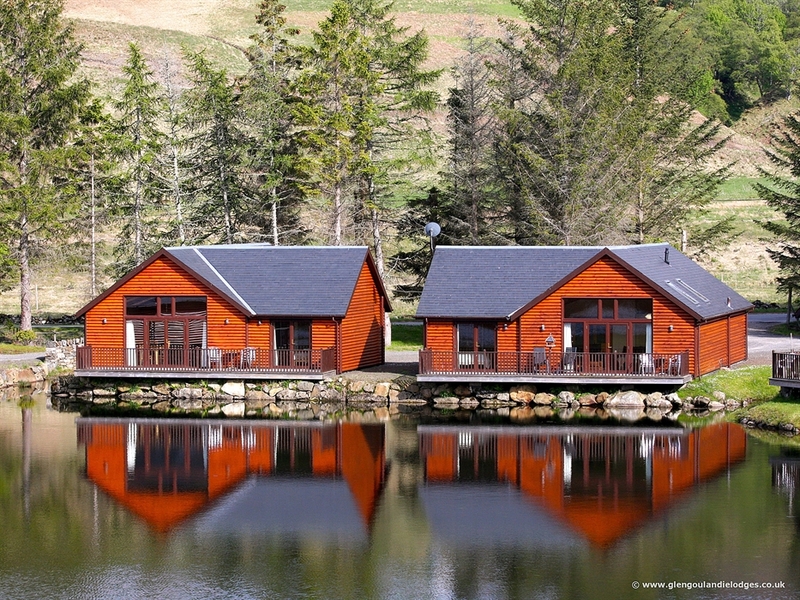 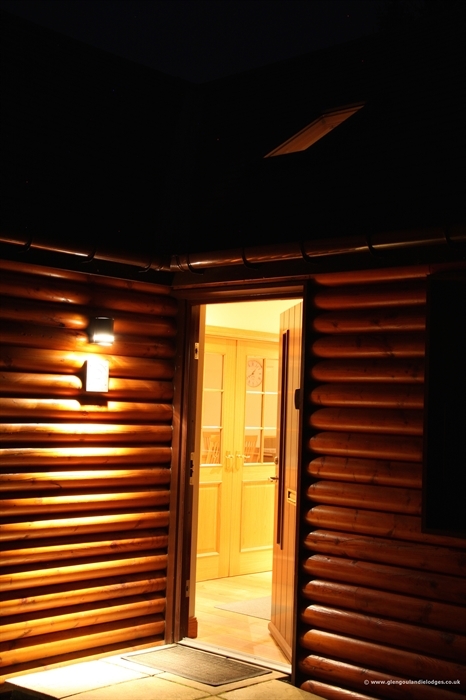 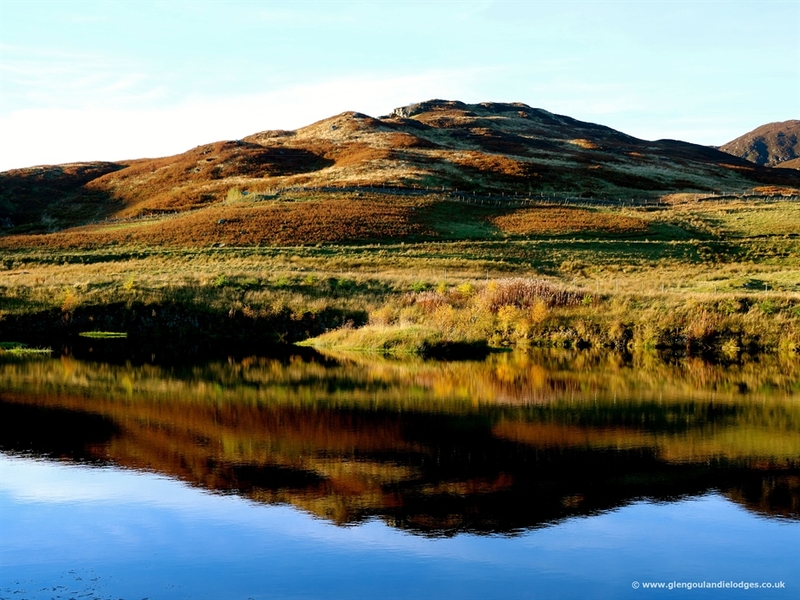 Our three award winning luxurious self-catering Lodges are unique to us and are situated on the waterfront of a beautiful Highland Lochan within Glengoulandie Country Park, in the heart of the beautiful Perthshire countryside, an area of outstanding natural beauty. 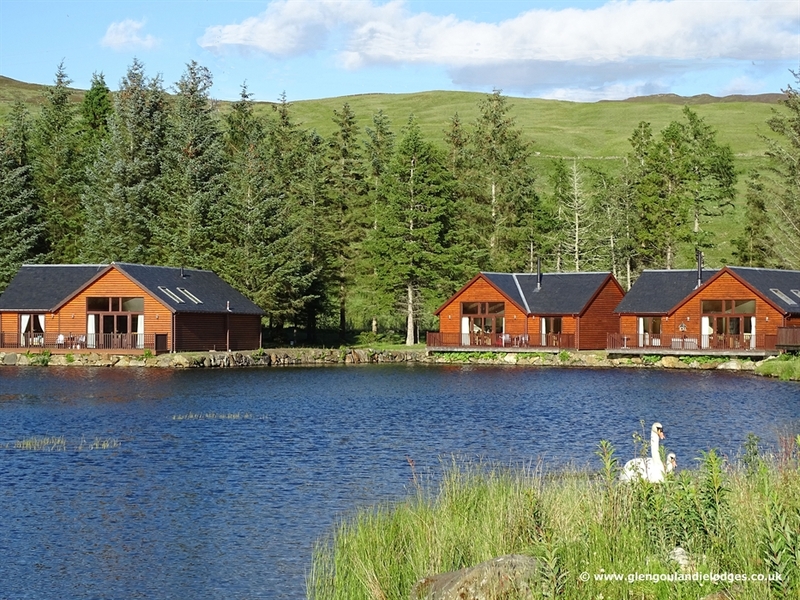 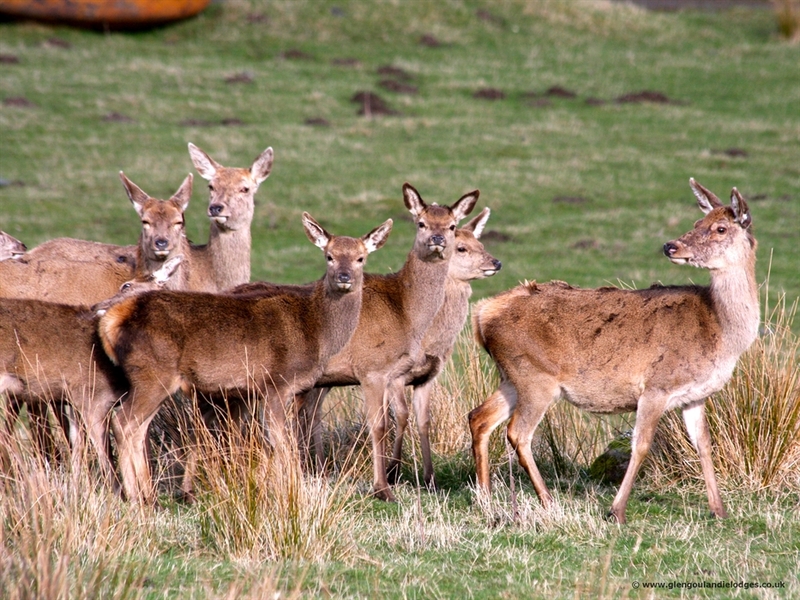 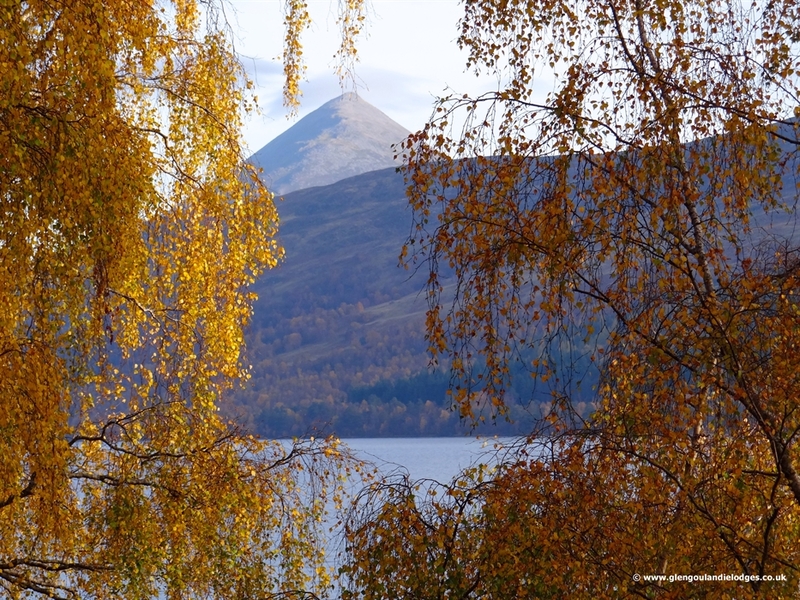 Our Lodges are ideal for older families and sit right on the edge of the loch, with wonderful views across to Glengoulandie Deer Park and the mountains beyond, with the peak of Schiehallion the 'Fairy' mountain just visible. 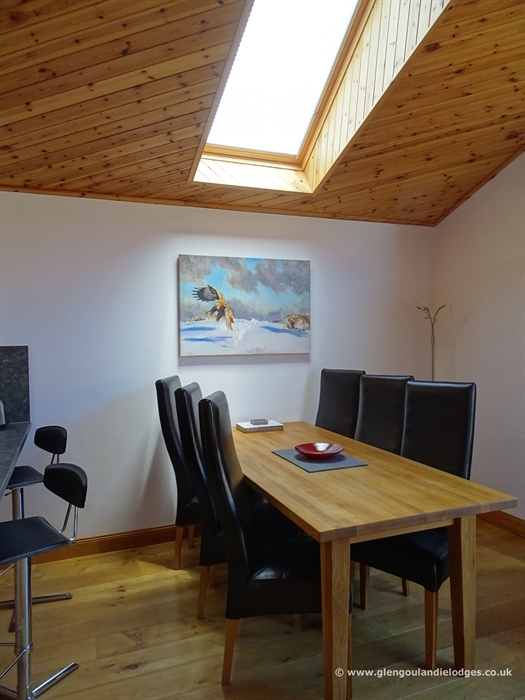 Bright, spacious, open plan living room / dining room with vaulted ceiling, oak flooring, and comfortable sofas. 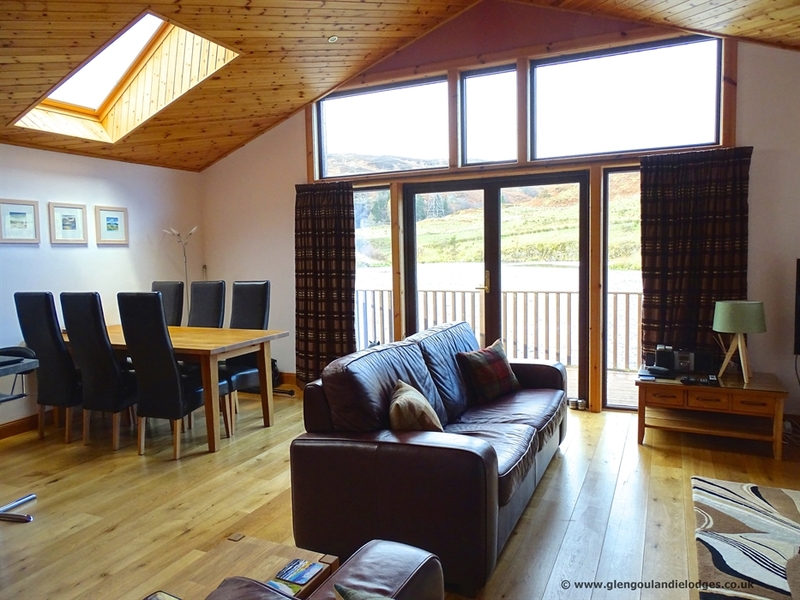 Large picture windows to make the most of the amazing views from the lounge and master bedroom. 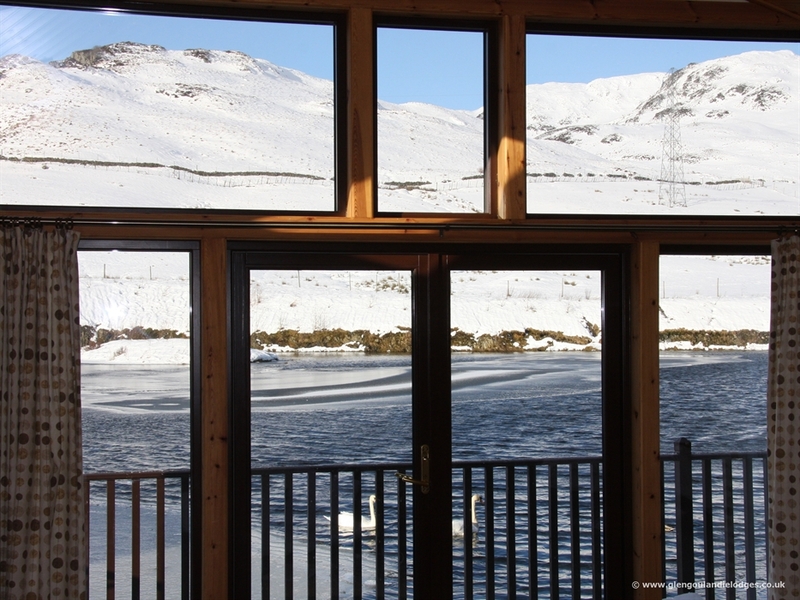 Large double doors lead out to a large balcony overhanging the edge of the Lochan. 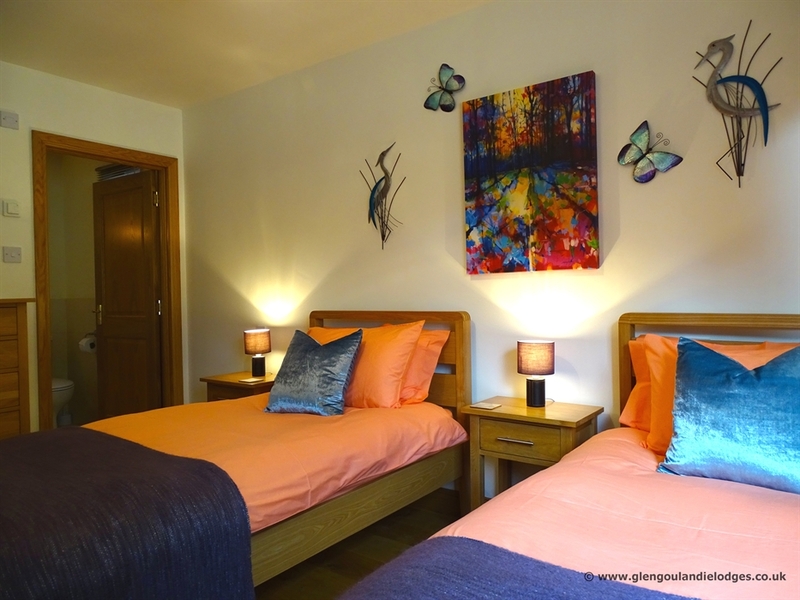 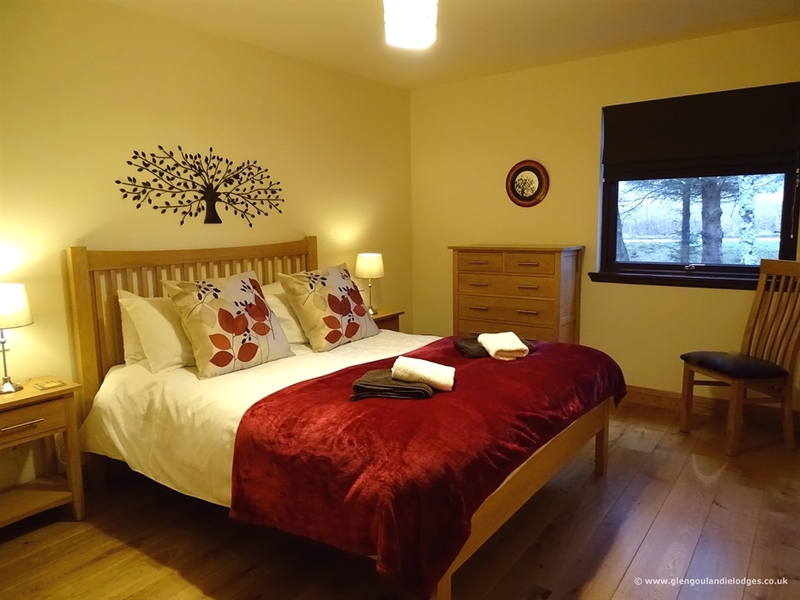 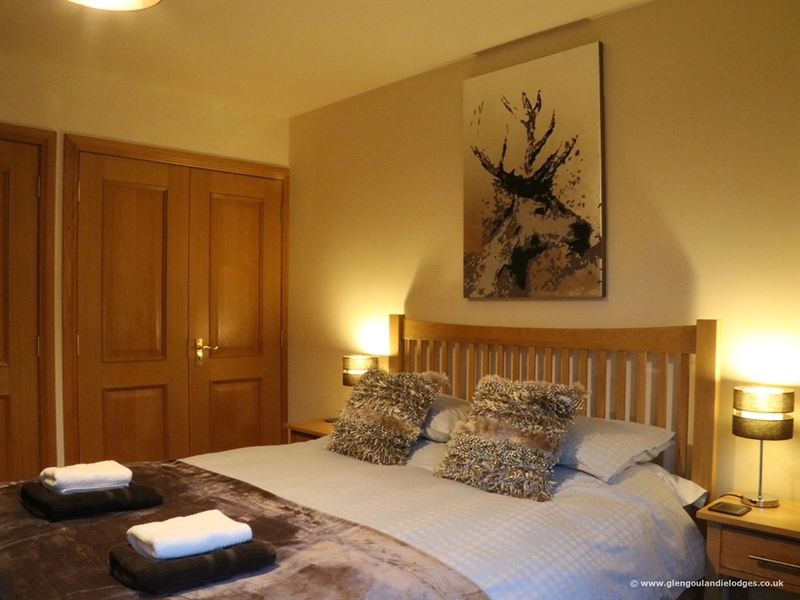 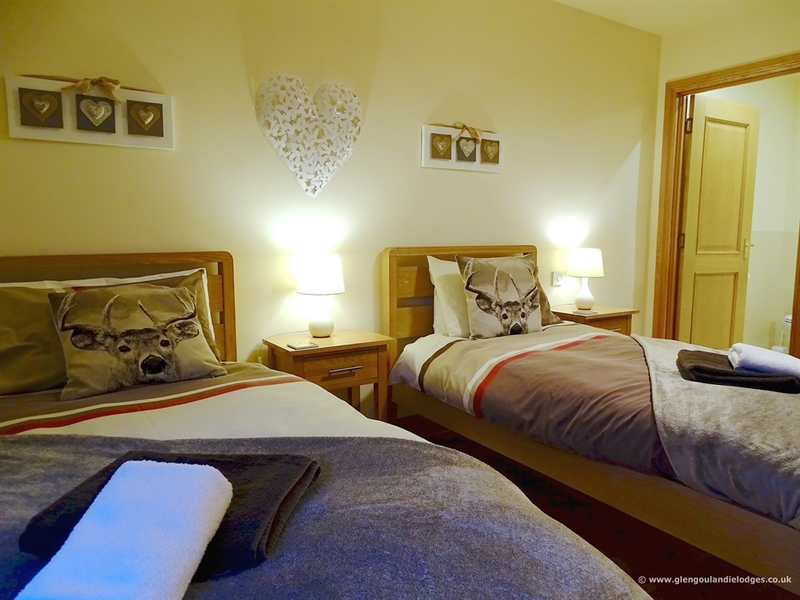 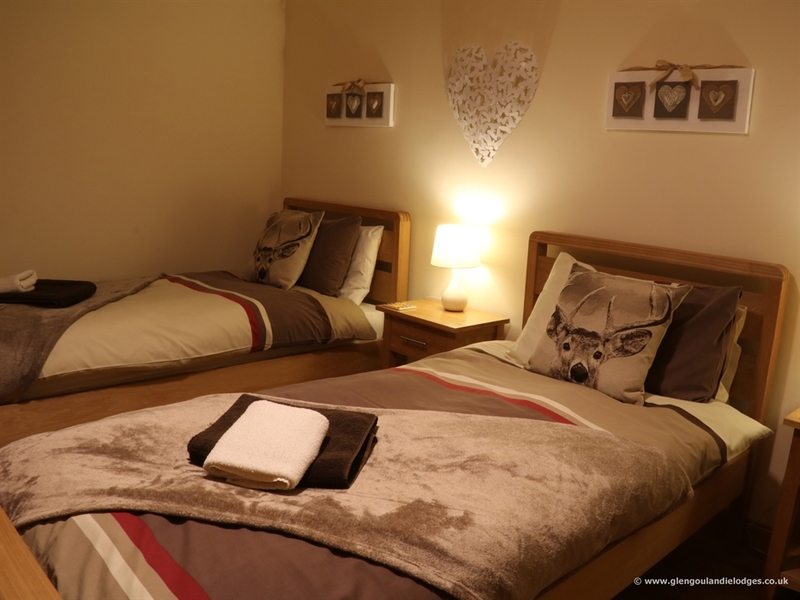 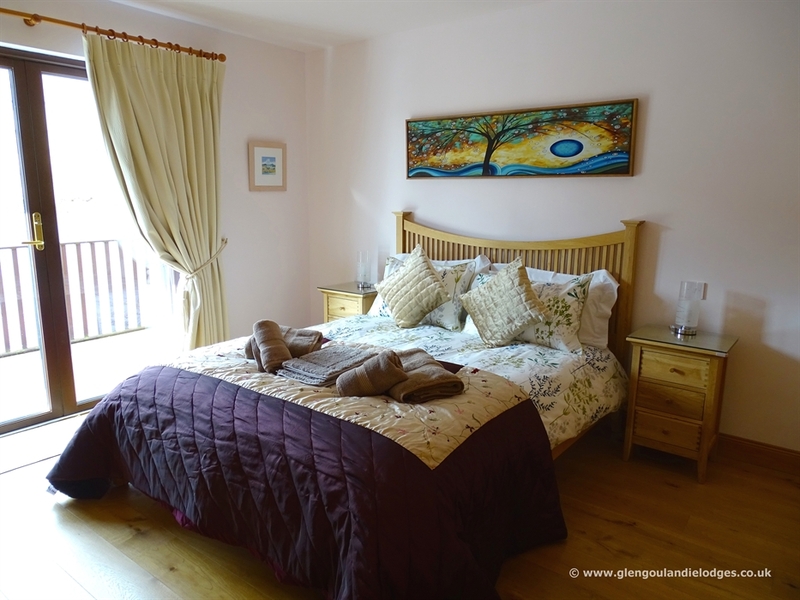 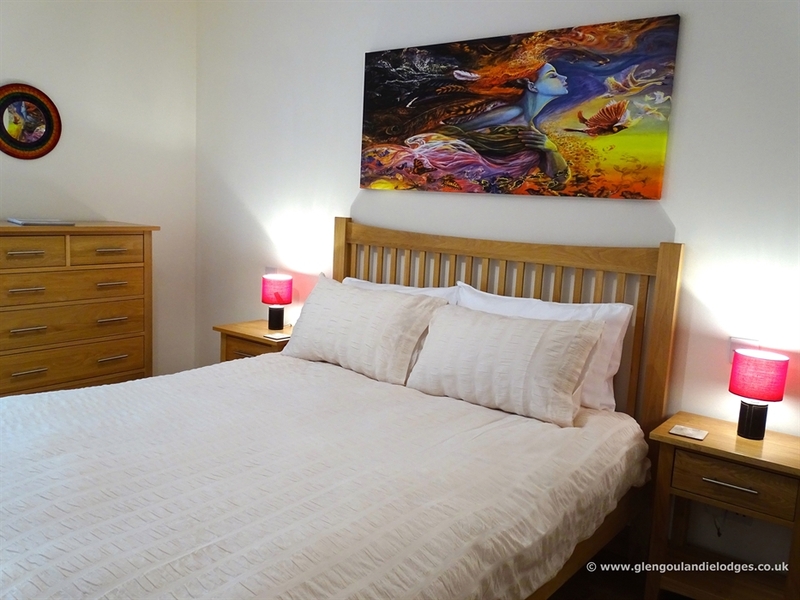 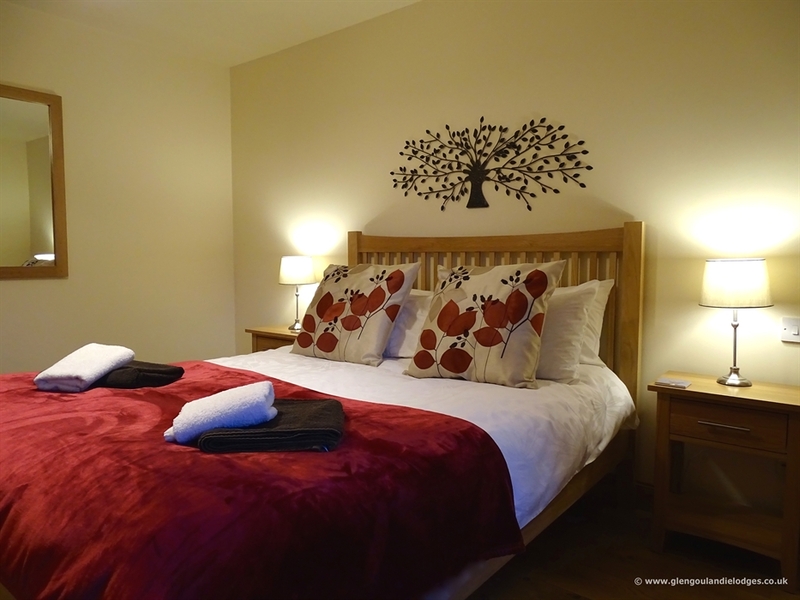 Three generous sized bedrooms (two Kingsize, one twin) with comfortable beds and built in wardrobes. 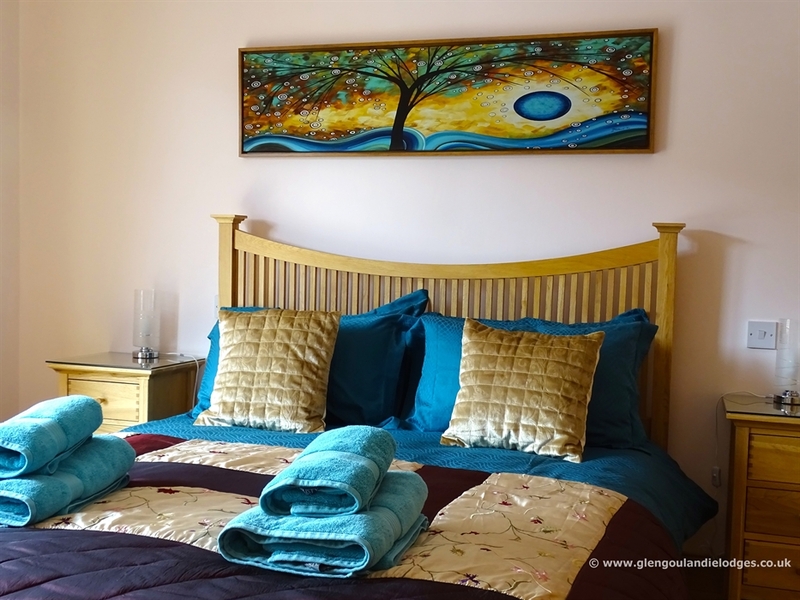 All with luxury en-suite / private bathrooms which are tastefully tiled. 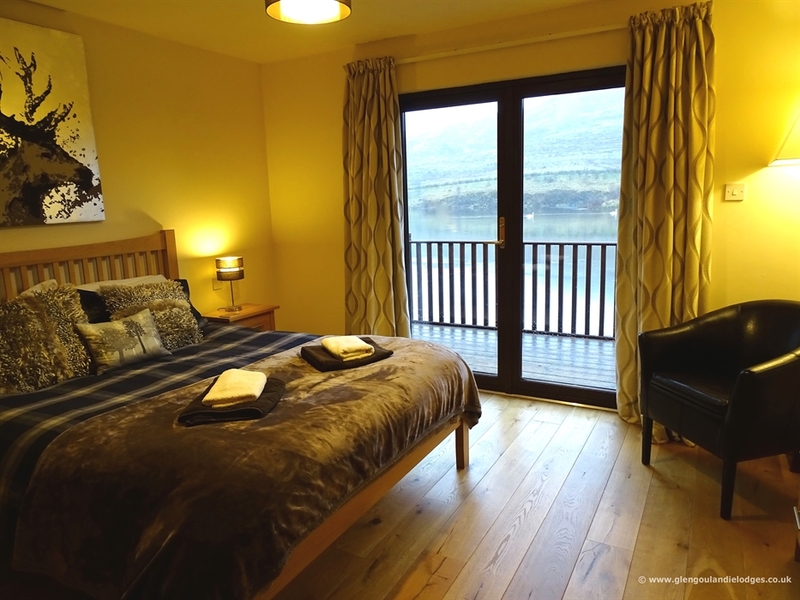 Master bedroom has its own Double doors leading onto the waterside balcony and the ever changing seasonal colours. 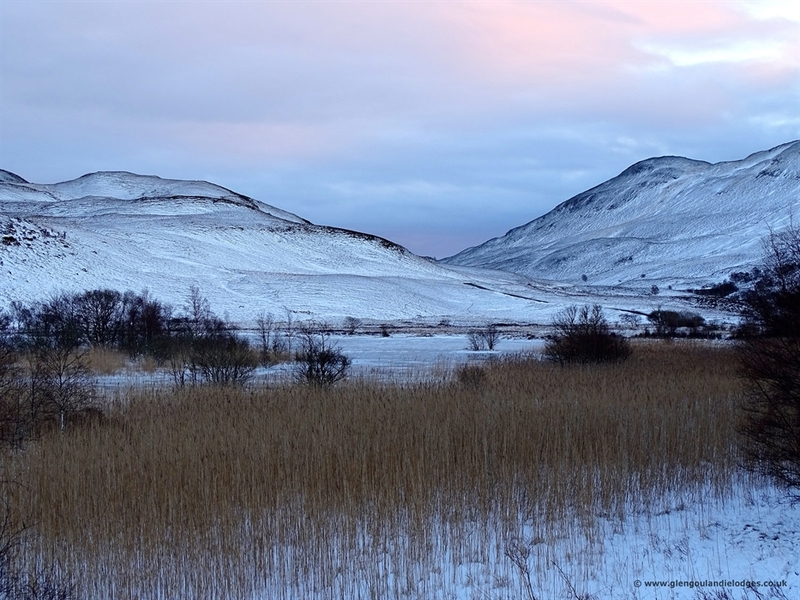 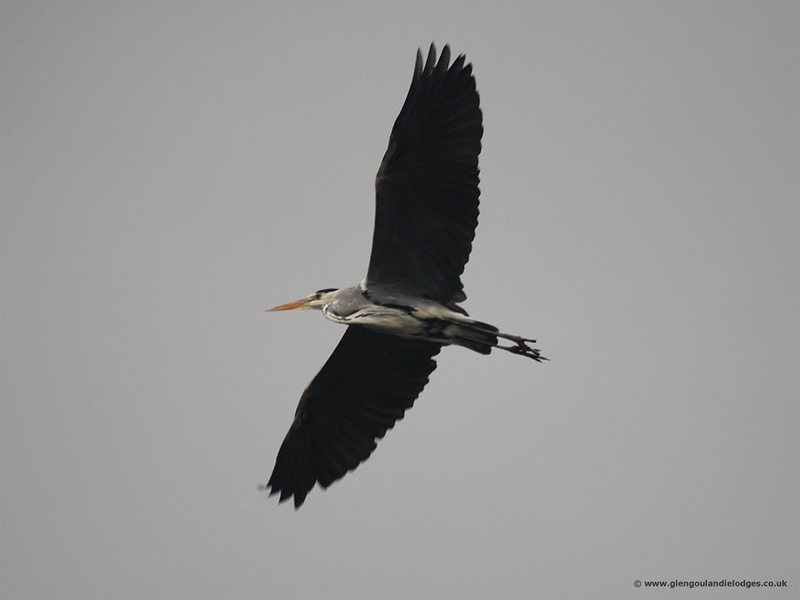 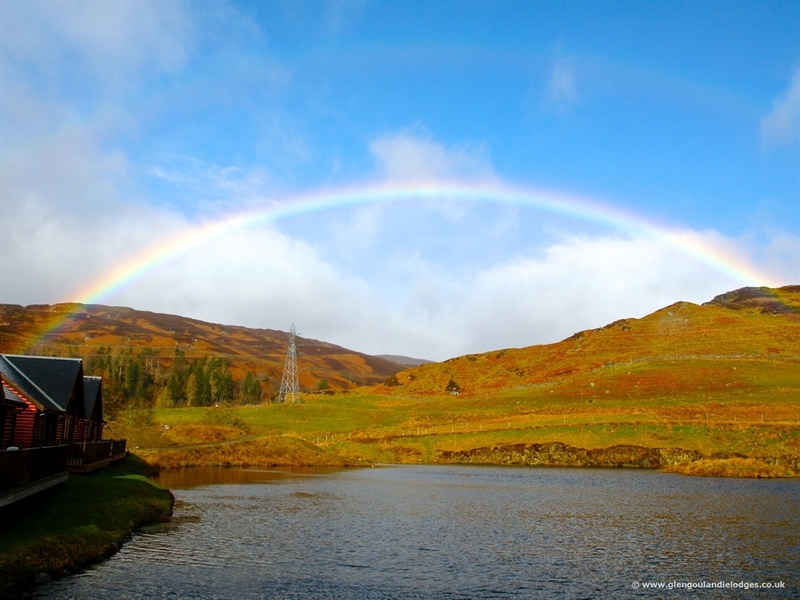 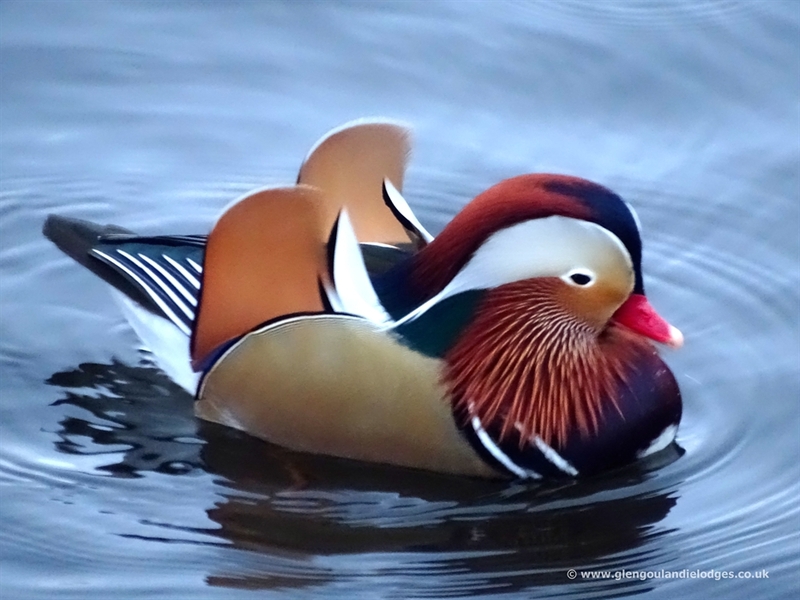 An inspiration for landscape as well as wildlife photographers – sunsets and rainbows abound. 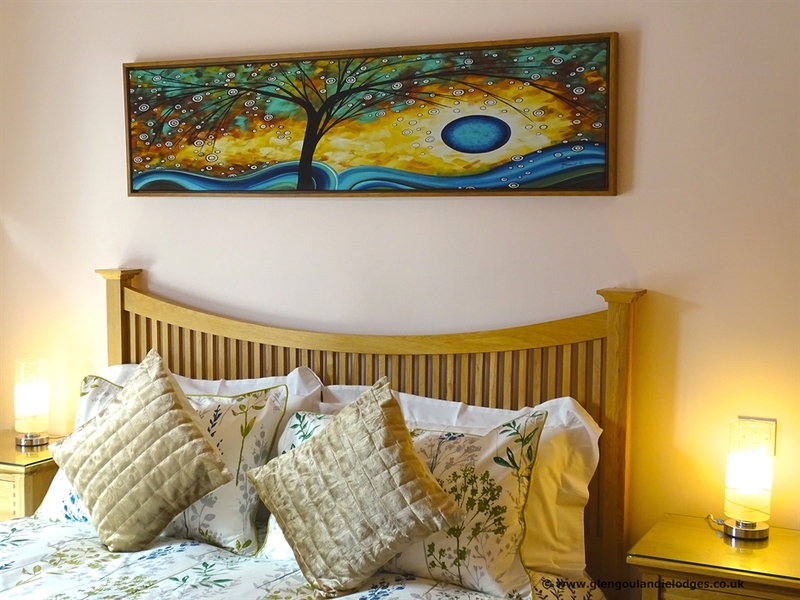 Spring and Summer colours inspire and lift your spirits. 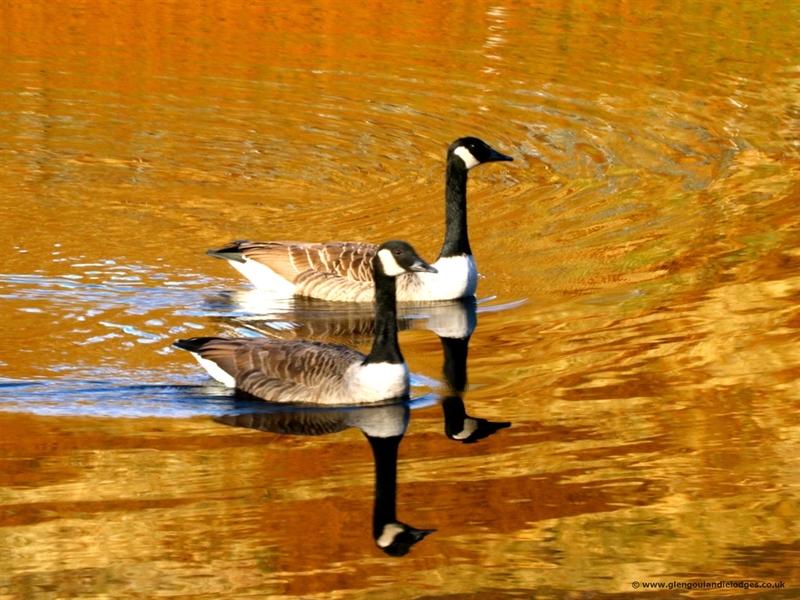 The fall with its rich rusts, purples and browns.The peace and calm from the first winter's snow, migrating birds, rutting deer and soy sheep in the park. 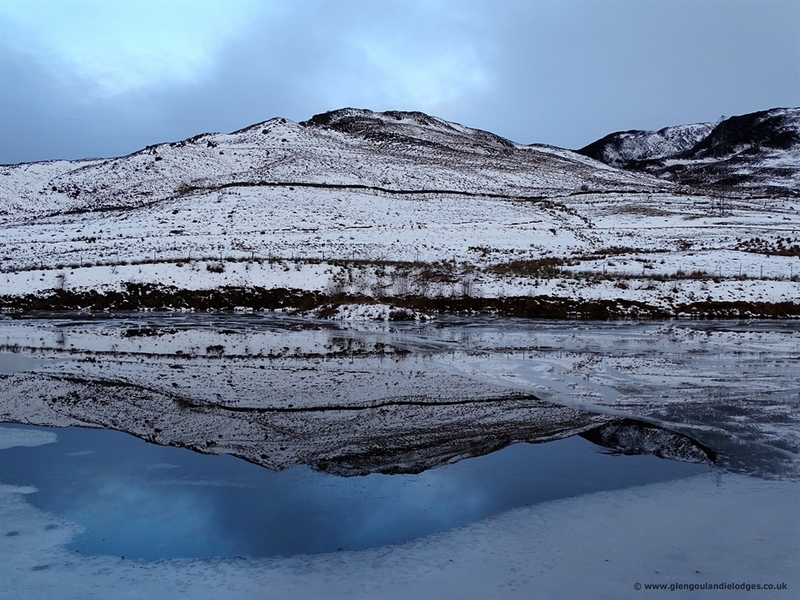 In every season is a wonderland filled with the natural wonders of nature. 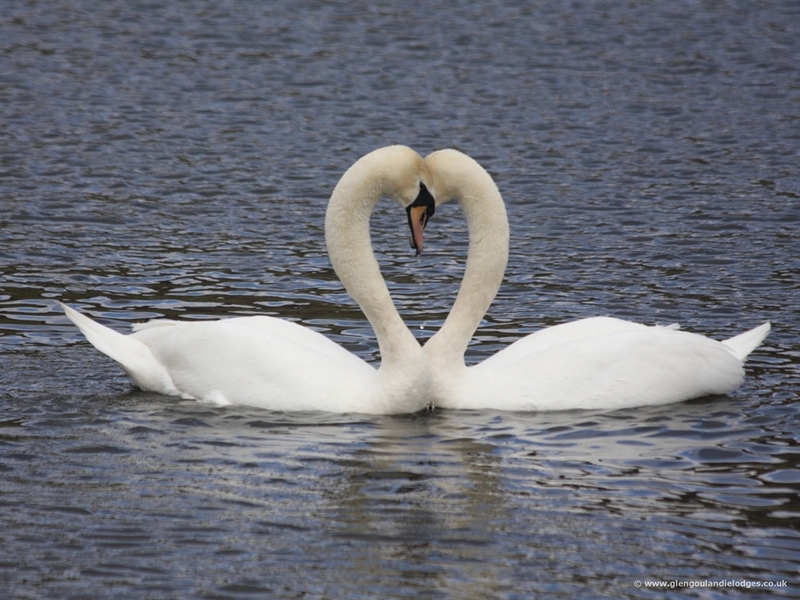 Thank you for you cooperation and your understanding. 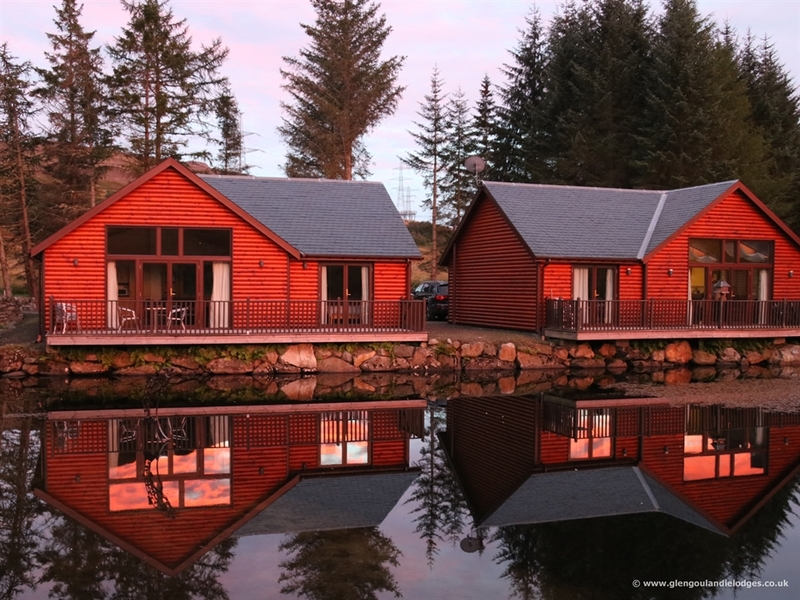 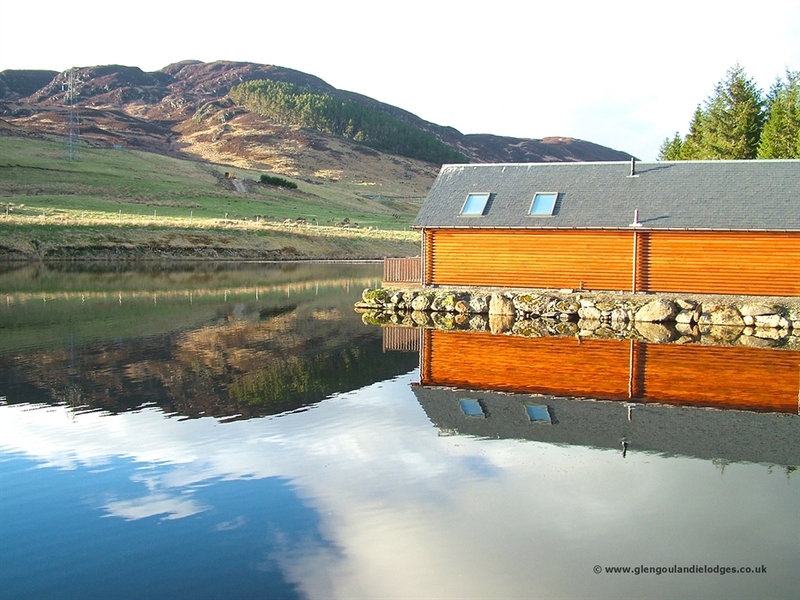 "Glengoulandie Lodges On The Waterfront"